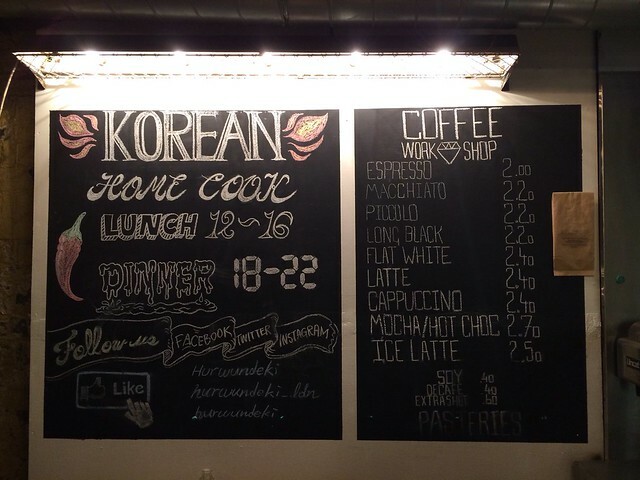 Hurwundeki - Korean Restaurant and a Hair Salon? 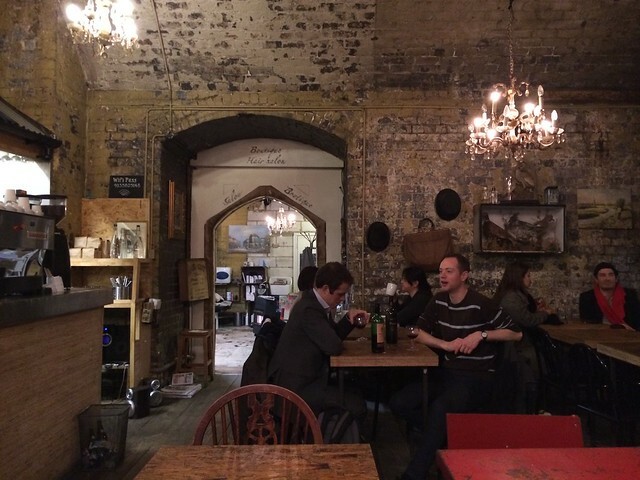 Close to the arches by Cambridge Heath station lies a small restaurant called Hurwundeki. I've grown up around the area so I am used to the big blue rail bannisters supporting the trains advertising "Mercedes Benz" and seeing a range of Mercedes Benz cars lined up. I was an 11 year old swooning over the cars with their Merc logo sticking out of their bonnets - owning one used to be one of my life goals. Well who feels old now? This was years ago when East London wasn't so trendy. 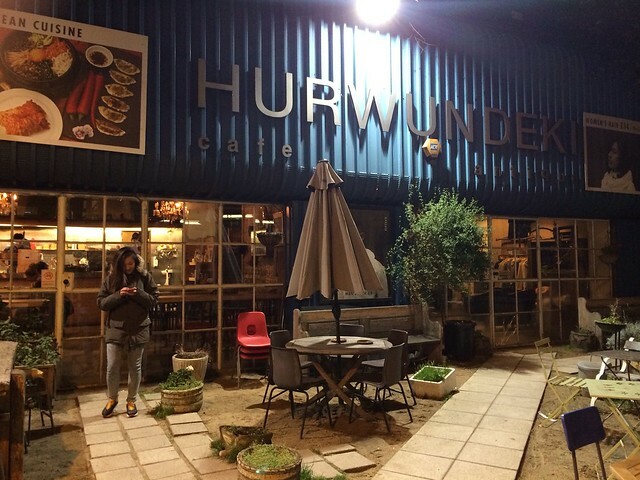 Replacing my memories is now this very cute Korean restaurant called Hurwundeki. 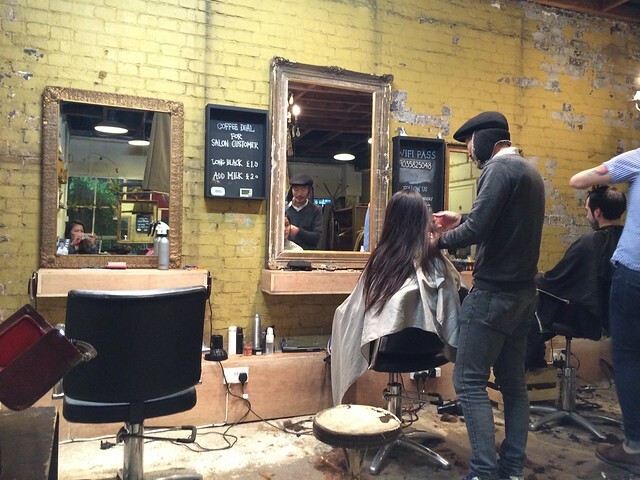 But this is a Korean restaurant with a difference, you can get your hair cut too and at a dirt cheap price. Now I know what you're imagining because when I first heard about it I imagined it too, just to let you know- it's not what you're imagining! The hair salon is completely separate to the restaurant. When you enter the, let's call it, front yard of the restaurant you will see that a lot of what was there in the past is still in tact. An old skool playground is decorated with tables and chairs for guests to sit down and eat in the warmer months- although shout out to the crazy lady we saw eating outside when we came, you cold blooded warrior! Inside Hurwundeki are wooden tables and chairs and a few tables lined along walls with high chairs. 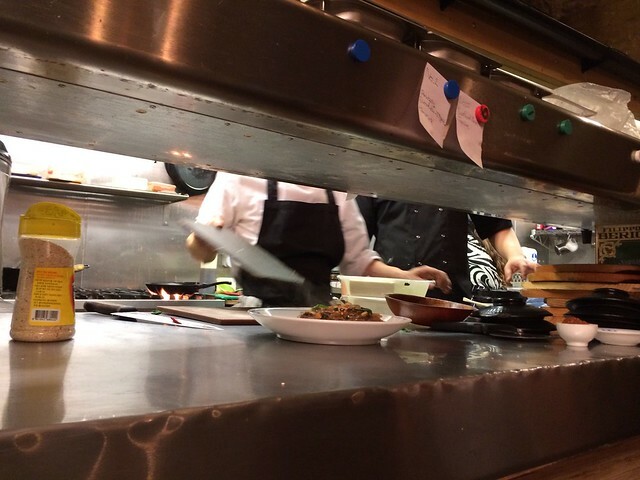 The kitchen is visible with chefs cooking up dishes. 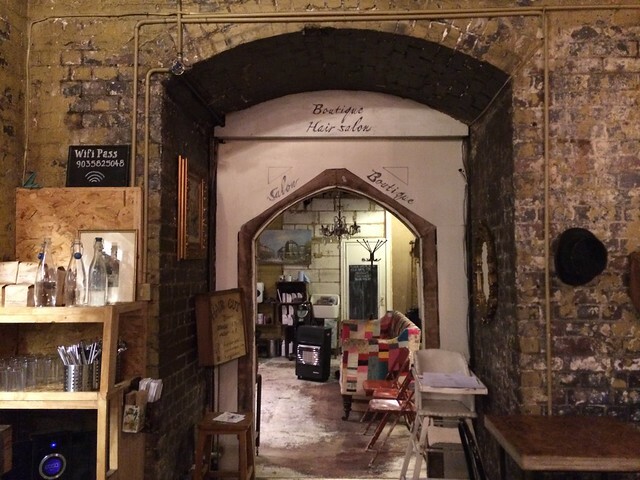 To the right you'll find an arched opening leading to the hair salon. 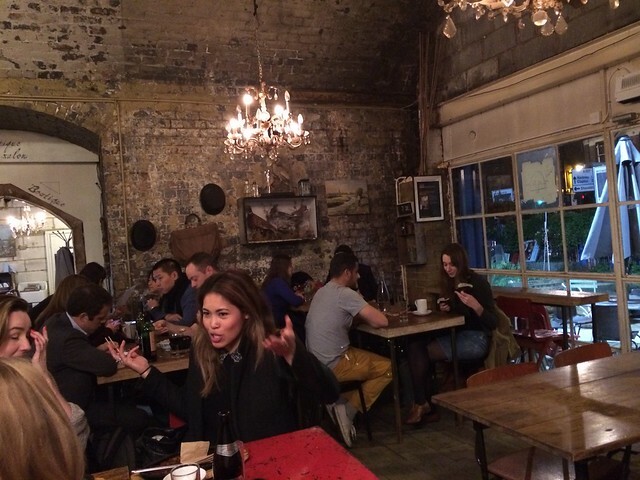 The restaurant has a rustic feel. So nice to see that a lot of the locations' old themes are still in tact. I got my hair cut by the owner of Hurwundeki- Ki. Ki was trained at Vidal Sassoon but charges only £14.99 for a quick but precise cut- no wash. My long locks definitely needed a trim and Ki did it impressively well at that price! Men can also get their hair cut too at a bargain price! Onto the important stuff- FOOD! For starters we shared Japchae (stir-fried sweet potato glass noodles), Seafood Jeon (Korean egg pancake) and Duk Boki (Korean spicy Rice cake). All the starters are huge and such good value for money! Ranging from between £3-£5 per starter you get plenty- more than enough for two to share. 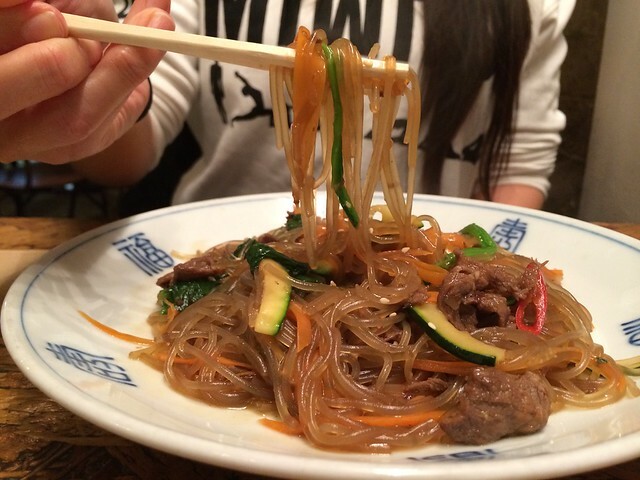 I love Japchae- mainly because of the glass noodles. At home I'm used to eating Vietnamese glass noodles made out of mung beans but Koreans tend to use glass noodles made out of sweet potato- these are slightly thicker and extra yummy. The seafoon jeon was so good! And big too. 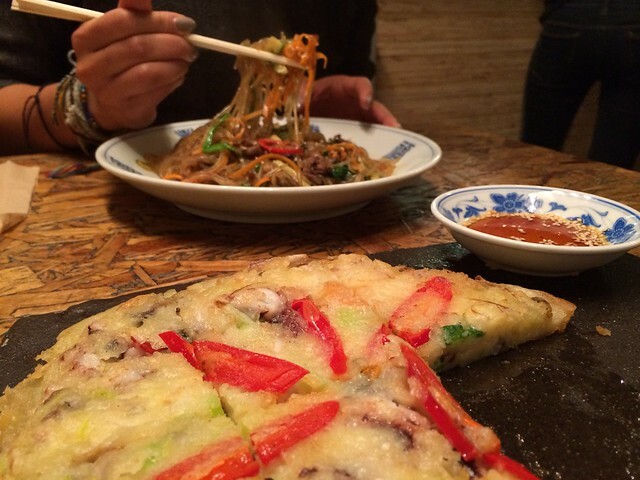 We didn't get to try the Kimchee jeon but we spied others eating it and it looked good too. It's made out of egg and isn't really a pancake- just shaped like one. I reckon it's more like a frittata. I luuurveee Duk Boki! 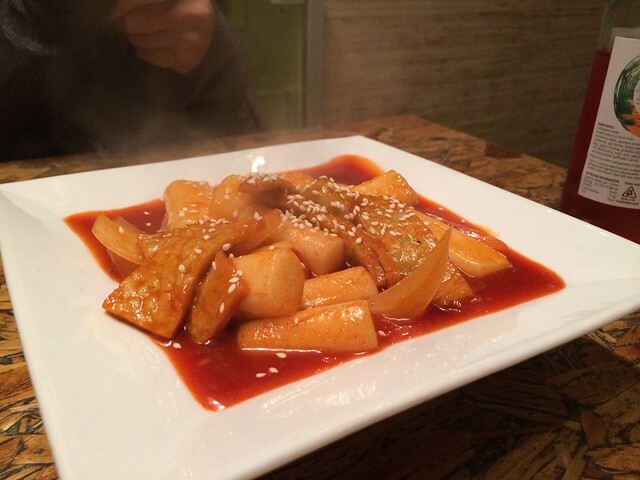 A dish mainly consisting of chewy rice cakes, not the dry circular shaped ones you find in a health store, but more like a giant udon chopped into bite size pieces. This was with sea food and topped with a deliciously spicy Korean chili sauce- NOMZ! 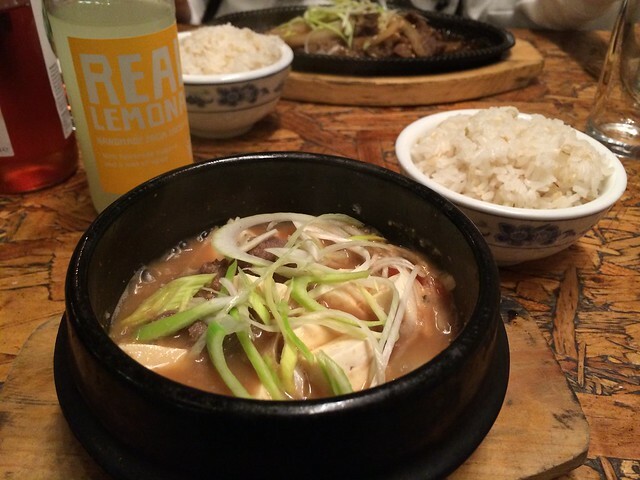 For mains I got the Beef Bulgogi and Rachel got the beef and tofu stew. The mains come with a small bowl of rice. This is what we call "Home Food". At home we would have a mixture of meat and veg dishes in the middle of the table and each person would have their own bowl of rice. Everyone would pick up bits of meat and veg to accompany their rice and eat from their bowls. To find this at a restaurant is rare. Thanks Hurwundeki- we love it! 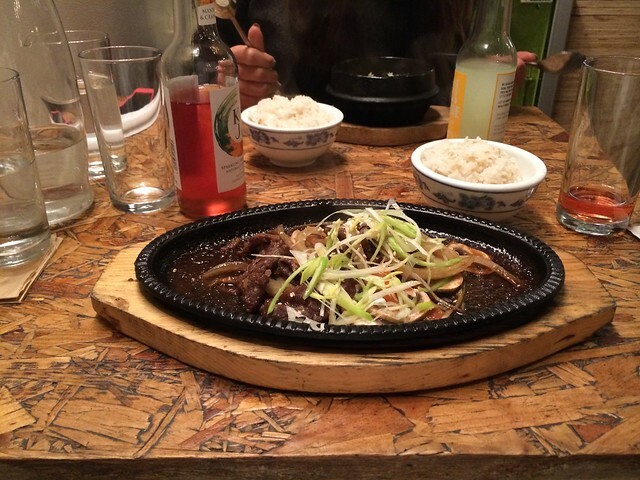 Beef bulgogi is thinly sliced beef cooked in a Korean style BBQ sauce- not too heavy and drenched in sauce like your normal BBQ dishes. Just right! The beef, tofu and vegetable stew in a light miso soup comes steaming hot in a cute metal pot- perfect home-style winter comfort food. If you have a sweet tooth the teas are definitely worth trying! And even better get 20% off your bill if you mention "Food & Lycra"- don't tell us we never hooked you guys up! Hurwundeki also offer 20% all takeaways- perfect for those nights in!